India is the country with a maximum number of women pilots in the world, be it in Air India or Indian Air Force. This is a testimony of the contribution made by women to the aviation sector, said Jayant Sinha, Minister of State for Civil Aviation, at an event for the Indian Women Pilots Association in 2017. We at Indian Eagle wholeheartedly agree with Jayant Sinha in the latest context of how a woman pilot of Air India, Captain Anupama Kohli, averted collision with a Vistara plane in the domestic sky of India and saved hundreds of lives on the planes of both airlines. On February 7, Air India’s Airbus A-319 (AI 631) from Mumbai to Bhopal, and Vistara’s A-320 Neo (UK 997) came very close to each other in the midair. The planes of both airlines flying in each other?s opposite direction were hardly at a distance of 100 feet between them, according to a news report from the Times of India. When the Vistara aircraft was flying down from its given level of 29,000 feet to 27,100 feet, Air India’s pilot captain Anupama Kohli saw it moving straight towards the AI plane from her left side. There was a woman pilot among the crew aboard the Vistara flight too. Anupama heard the Air Traffic Controller arguing with Vistara’s woman pilot. While the argument between the Air Traffic Controller and the Vistara pilot was in full swing, the Vistara aircraft came within a distance of 100 feet from the Air India plane. The red sign in the AI aircraft’s cockpit signaled an impending danger to Captain Anupama Kohli. But she neither hit the panic button nor found herself at her wit’s end. 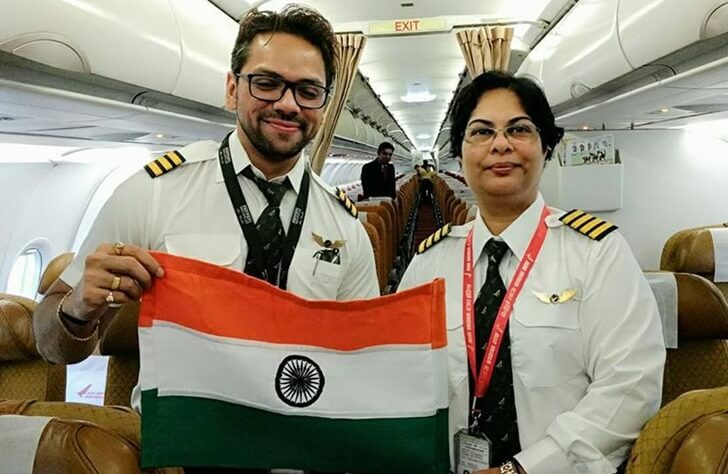 Following a resolution advisory (RA) from the Air Traffic Controller, Air India pilot Anupama Kohli jumped into action. She immediately steered the plane to a certain height from the then level and turned right to get out of the Vistara plane’s path. The male commander of Vistara’s A-320 Neo (UK 997) was on a toilet break during the juncture. Thus, Anupama Kohli distanced Air India’s Airbus A-319 (AI 631) to 600 feet away from the Vistara aircraft and avoided the tragedy which would otherwise have claimed hundreds of lives aboard. Both planes reached their respective destinations safely. Air India applauded Captain Anupama Kohli for her presence of mind and quick action. Captain Anupama Kohli is a senior commander of Airbus 320 with experience of over 20 years. We at Indian Eagle salute her. Air India is one of the few international airlines operating nonstop flights on certain routes between the United States and India. This commendable feat by Captain Anupama Kohli will surely benefit Air India and help the airline capitalize on the confidence of travelers. Though we book the cheapest Air India flights from USA to India, some of our customers prefer other airlines than Air India for some reasons. Hope, this incident will revive their lost faith in Air India, said a senior spokesperson of Indian Eagle, a leading travel booking organization. I live in Usa for 22 yrs and 4 time traveler of AIin these 22 yrs and I had enough problems with the staff on Board. Neither they help ppl with health issues, they are extremely weak and Look unhealthy to help passengers with beyond normal weight. Don’t get me wrong, I am a heavy weight myself not critiquing but People who are Police or army or bus conductors or doctors or Airhostess over weight even with 10 jag wouldn’t deliver good service period these jobs need some finesse and good strength to assist people. These are basic courtesy one expects. I was told to lift my own cabin baggage in to the cabin slot because Airhostess cannot do it as she also has back pain. I told her I have spinal arthritis not back pain. Later a co passenger helped me. Until and Unless someone speaks a foreign slang in English the Air India staff does not care and it’s unfortunate that knowing is our Indian air plane ✈️ we assume n want to send our parents in It hoping they travel safely but now many NRI prefer searching Other Indians in different airlines to send their parents home with them. AI staff need serious workout regime to keep themselves fit, they need courtesy training, they need to know their checks come from passenger not from airlines, AI needs to get them Shalwars not sarees because Some ppl like me are not ready tobelky buttons with pens stuck on their waist, AI staff needs to stop getting irritated with Call bells or rolling eyes, argue with passengers if they don’t understand or your staff is tierd. So don’t point or expect Indians to travel in AI till it changes its manners and it’s approach. Appreciate Anupama The hero Pilot for saving lives and being a women I bow to such good service and saving lives. AI staff needs serious training and I can personally train a team to handle passengers because AI would loose its customers to Qatar, Emirates, Eithad, British, Lufthansa or Singapore Airlines. Note: Being Indian we like to support our economy and airlines but with such ignorant service – We would prefer other airlines because we need respect, dignity and courtesy during our journey not be treated like Slaves who lack money to afford. Hats off to the lady pilot she saved many lives on both the plane !! Not just cancel the license but hand out a jail term for attempted murder!! The reason people prefer other airlines to Air India from USA to India is the service and cleanliness. I Was on a flight recently from Washington, DC to Delhi and back. On return flight, I used the bathroom in a four hour period twice. The first time there was no bathroom tissue, but luckily there was a tissue box half full. The second time, no bathroom tissue and the tissue box was empty!! Nobody checks the supplies and shows the type of service. I have not used Air India for over before for a long time. This time I wanted to try the direct flight to Delhi. We were had flown back from India in mid February.It was the most uncomfortable flight we have ever taken. No one should ever have such an experience. It was a nonstop flight from Delhi to New York, As we were settling in, we noticed that the seat cushions looked extremely old and completely worn out. When we sat down, you could actually touch and feel the metal underneath the worn out thin cushions. We complained to the flight attendant whose remedy was that he would provide us with extra pillows to put under us. That was not what we should have been told. The flight was a nonstop 15 ½ hour flight. When we complained again, he pleaded with us not to get upset and angry and he would try to find us better seats. However he informed us that this was a full flight. He finally found us two seats a few rows in front of us, which were not much better. They were seats in the middle aisle not the corner seats we had original had. As we were settling in, an elderly couple came in and showed us their boarding passes for those very two seats. So we now were sent back to our original worn out seats. We spent the next 15 1/2 hours on the flight adjusting pillows and blankets just to make sure that we weren’t sitting on the metal frame underneath the cushion. An old plane such as this one should have been refurbished with new and comfortable cushions if the plane was still being used for air travel. May be if the upper management of Air India and the flight staff were to spend 15 ½ hours on a nonstop flight, they would have a better understanding of a passenger’s extreme discomfort. I am very sure that he would quickly work on replacing the worn out seat coverings that were being passed off as seat cushions that would provide comfortable seating on such a long flight. No apologies were offered by any of the flight crew. I am going to be writing and lodging a complaint with Air India. Absolutely shameless audacity ! First put the lives of the passengers in danger by their incompetence and then hope for prayers to work . When prayers worked, they are claiming the credit ! Commendable………I always use Air India. Always find it very convenient and Hassle free.